It’s been a decade since the market crash known as the Global Financial Crisis rocked the investment world. At the time investors could only watch in disbelief as 50 per cent was wiped off the value of their shares. Arguably, the actions those investors took are still reverberating today. 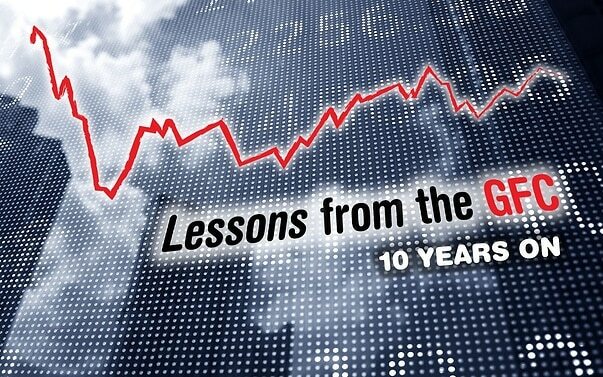 Which begs the question: what are the key lessons of the GFC and did we pay attention? While investors who lost money would probably rather forget, it’s worth recapping what caused the crisis and how it unfolded for a new generation of investors. Predictably, there were warning signs for some time before the eventual market crash. Just as predictably, no-one could predict the exact timing or the magnitude of the crash. Ground zero of the GFC was in middle America. A lengthy period of low interest rates and poor home lending practices left homeowners vulnerable when rates began to rise and house prices fell below the amount they owed the banks. When whole neighbourhoods walked away from their homes and their debts, the liability shifted to the banks. Compounding the housing bust was the proliferation of new financial products that packaged up sub-prime loans along with higher quality debt and sold them on to global investors. These derivative products with names like collateralised debt obligations (CDOs) were sold as cutting edge but few investors understood the risks. As early as 2002 Warren Buffett, the world’s most famous investor, referred to derivatives as ‘financial weapons of mass destruction’ that would ultimately cause great damage. He was right, but it took the market five years to catch on. When in 2007 investors tried to dump their CDOs the investment banks that issued them were unable to finance redemptions. The crisis led to a credit crunch and the eventual collapse of major investment firms like Bear Stearns and Lehmann Bros.
As investors from Detroit to Dubbo lost confidence, the shock impacted markets around the globe. The Australian sharemarket followed Wall Street, falling around 50 per cent from its peak in November 2007 until it hit rock bottom in March 2009. Ten years is a long time on global markets. The US sharemarket is experiencing its second-longest bull run in history – eight years and still going strong. 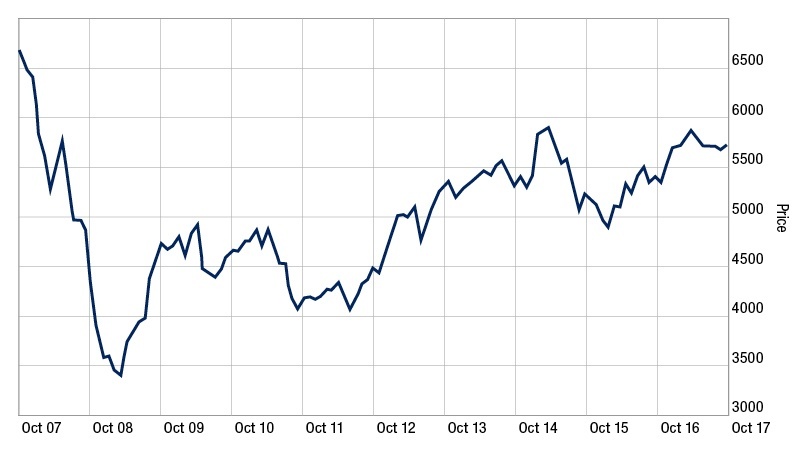 Australian shares have also had eight good years, although prices are still below the 2007 peak. Overall, 21 per cent of investors said they had little tolerance for risk but still expect annual returns of 10 per cent plus, which is unlikely in the current low interest rate environment. Worryingly, less than half have diversified portfolios even though they say they understand what diversification is. But the real surprise was that older investors who lived through the GFC were less risk averse than younger investors who have no direct experience of a market crash. Four out of five investors aged under 35 said they looked for stable or guaranteed returns while 41 per cent of investors over 55 were comfortable with some volatility. Perhaps part of the reason for the discrepancy is that older investors have learned what goes down comes back up, albeit with some twists and turns along the way. Time in the market also makes investors aware that one year’s best performing asset class can be next year’s worst, and vice versa. The best way to avoid timing the market is to have a diversified portfolio and ride out the short-term volatility. These lessons were borne out recently when Vanguard looked at the outcome for three investors with a diversified investment portfolio of 50 per cent shares and 50 per cent bonds when the GFC hit.ii When the market bottomed in March 2009 one sold the lot and switched to the relative safety of cash. One sold all their shares and put the money into bonds. And one stayed put in a balanced portfolio in the hope that the market would recover. Fast forward to 2016 and the investor who fled to cash was sitting on a cumulative return of 27 per cent. The investor who put everything in bonds had a return of 71 per cent. But the investor who sat tight with a mix of shares and bonds enjoyed the best return of 93 per cent. The big lesson of the GFC, and all the market crashes that preceded it, is that markets move in cycles. While each boom and bust cycle is slightly different, investors who understand the trade-off between risk and return, hold a diversified portfolio and stay the course are best placed to ride out market cycles for long-term success.